In his latest exhibition, “The Infanttree Project,” Samford University art department professor and chair Larry Thompson brings attention to the unspoken impacts of past and present wars. “Art should reflect the culture and time in which it was created,” believes Thompson, who in the show at Birmingham’s Space One Eleven gallery critiques America’s complacency and foreign policy in a post-9/11 world. The exhibition of two sculptures and 11 paintings in mixed media reflects issues that soldiers and their loved ones face, especially the loss of life as a consequence of war. It will be available for viewing through April 29, 2016. Since opening on September 11, the show has been appreciated by viewers of different ages, backgrounds and personal experiences with war. Thompson recalls an unexpected observation from a gallery visitor who thanked him for a particular piece titled 6,835 and shared what it meant to her. The oil on wood piece shows empty Marine boots on a cracked desert floor with a dog tag on the laces. Over that image is the number 6,835 with other numbers displayed as if an odometer is about to tick to the next number. Thompson recalls starting the work on Memorial Day in 2015. “That morning, 6,835 service members had perished since operations began in Iraq and Afghanistan,” said Thompson. The visitor, however had a different “read” of the painting. A veteran of the first Gulf War, she explained that when military personnel check the identity of the fallen they call out the last four numbers on the name tag. “She read it that I was humanizing a number by showing the soldier’s empty boots, thus remembering a fallen solder not as a number, but as a human that had once walked the earth. That was such a beautiful interpretation,” said Thompson, who tries to create in a way that allows viewers to complete the work given their own unique baggage. “To have a veteran have that emotional response to a piece was gratifying,” Thompson said. The idea for “The Infanttree Project” began several years ago when a Samford employee asked Thompson to create a large banner that would encourage Samford students to donate socks to her son’s military unit in Afghanistan. The conversation, Thompson said, reminded him of the disconnect that two 19-year-olds can have. “One in an incredibly safe place such as Samford. The other in a dangerous battlefield. That banner started all the ideas for pieces that ended up in the exhibition,” said Thompson, who joined Samford’s School of the Arts faculty in 2007. The show is supported in part by grants from the Alabama Humanities Foundation and the Andy Warhol Foundation for the Visual Arts. For Presidents’ Rug, a plastic and acrylic on wood that asks questions of decision makers and those who bear the weight of those decisions, he worked with non-traditional materials in a way very different from his usual painting process. His piece, The Infant Tree, a play on the word infantry, underscores war’s varied impact on society, especially as it relates to children. 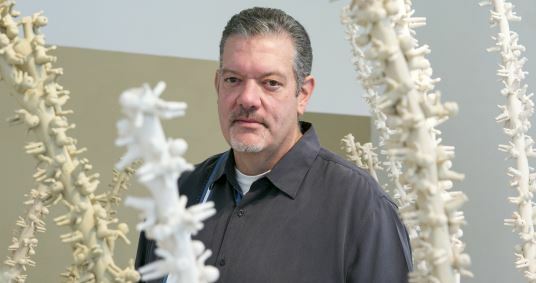 The large mixed media work was inspired by the Ocotillo cactus, common in Thompson’s hometown of El Paso, Texas, home to Fort Bliss Army Base. In conjunction with “The Infanttree Project,” Space One Eleven is also displaying pieces from “Reflections of Generosity—Reflections of the Soul,” an exhibit organized by artist and Iraq and Afghanistan veteran Ron Kelsey. The works by veterans of various wars explore the use of art therapy to help those affected by war. The Samford art gallery displayed a larger showing of “Reflections” earlier this fall. Several programs that complement the exhibitions have engaged the public in dialogues on the general theme of art and war. A discussion at Samford on September 11 focused on the history of art as therapy and the resurgence of art therapy program since the terrorist attacks in 2001. “That event drew a diverse mix of people and I think reminded us all that art can and should at times serve a purpose higher than simply looking good,” Thompson said. On Veteran’s Day, November 11, at 5 p.m., Space One Eleven will host a discussion on ”The Systemic Causes and Implications of ‘Invisible’ Warfare, and Contemporary Artists’ Responses to War and Their Efforts to Make it Visible.” The public is invited free of charge.